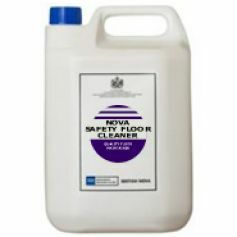 Nova Safety Floor Cleaner has been specially designed for routine and "deep" cleaning of all types of safety flooring whilst at the same time disinfecting and re-odorising all in one operation. It is ideal for use in hospitals, nursing homes, clinics, surgeries, kitchens, canteens, hotels, schools, washrooms, lavatories and offices. Containing carefully balanced components, this alkaline cleanser is quickly effective against a wide range of soiling’s on all hard surfaces that water and alkaline cleaners will not harm. Contains cationic, bactericidal quaternary compounds and possesses strong surface activity for rapid soil removal. In addition, an unobtrusive but refreshing deodoriser lingers to maintain a pleasant working atmosphere, the sign of a clean environment. with water and alkaline detergents. Always prepare solutions freshly and accurately in clean containers. Mop the floor with the solution and leave for up to 5 minutes depending on the degree of soiling before picking up the slurry. A more concentrated solution can be used for disinfecting and deep cleaning problem areas such as lavatories, urinals and bin areas etc. After use, wash out and soak the mops/cloths etc. in a 1:50 solution of the same product to keep them hygienic and germ-free.